Pioneers in the industry, we offer dewatering pumps, air hydraulic pumps, two stage hand pumps and electric powered hydraulic pumps from India. 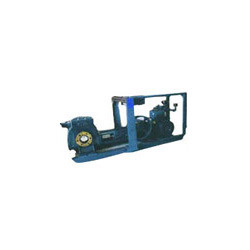 We are the prominent manufacturer and supplier of Dewatering Pumps as we use quality raw material. These are completely designed for vacuum dewatering and have a lot of advantages as compared to other pumps (centrifugal). Our wide range of Dewatering Pumps are highly appreciated by our clients all across the globe due to its quality material & various features. 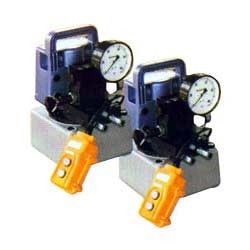 Air Hydraulic Pump is a mechanical tool used to initiate the work process of hydraulic companies. Our pump is offering high and uniform working efficiency. In the manufacture of this type of pumps we are using good quality raw material. Our product is durable and offering a long shelf life. Our pump is easily installable. 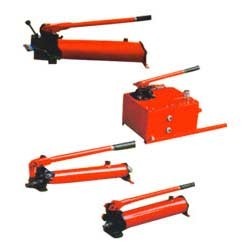 Air Hydraulic Pumps are designed for fast operation, greater versatility and durability. Ideal pump where Shop-Floor air is available at 7 bar. Carrying handles are of treadle design, which allows easy operation by hand and foot. Built in Relief value protects hydraulic systems components regardless of air pressure. Assembly can be done to fit on larger reservoir (if required). Provides greater speed at low cost. Positive holding even if air pressure turned off. It is recommended to attach a Filter-Lubricator unit at air inlet. Our company is manufacturing a special kind of hand pumps offering both single and double stage working. This product is light weight and very flexible to use. High standard quality parameters are defining our product efficiency. Beside that Two Stage Hand Pumps is very easy to use and offering a long shelf life. Two Stage Pumps in connection with 4- way 3- Position Hand Operated Directional Control Value are required for Double Acting Jack / Ram / Cylinders. They work on a Lift- Hand Retrace Mode. Hand Pumps are compact, light weight and portable. The Pressure relief Valve is pre-set at full working load. Two-Speed Pumps have from automatic change over from LP to HP. 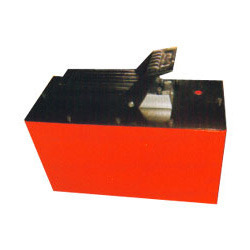 Single Speed Pumps are used for Jack / Ram / Cylinder where the stroke volume required is low. Two speed hand pumps are recommended for applications where the stroke volume required is large i.e. Larger jack/ram/cylinder or multiple cylinder/jack lookups. It facilitates rapid approach and hence reduces cycle time. Electric Powered Hydraulic Pumps are designed to easily except various kinds of stacking values such as Solenoid Valves, Relief Values, Check Values etc. for almost any application. Solenoid Valued Pumps combine maximum productivity and energy saving with ease of use and are an ideal choice for production, lifting and maintenance applications. Lightweight and portable  16 to 20 Kgs., with easy carry handles. Providing high flow of 2.5 LPM at 1st stage upto 70 Bar and 0.35 LPM upto 700 Bar.